“They were gone,” I finish, and he reaches to turn the page. He remembers the story. He remembers the pattern to the words, the cadence and the repetition. Because that’s what stories do. The good ones stay with you. They help you to remember. This is what Dr Joseph (Jo) Griffin talked about at the PMI EMEA Global Congress in London earlier this month. He talked about why managers should be adept at storytelling at work, and started by giving four reasons. They engage us in a way that data alone cannot. They frame the data memorably. They provide context and highlight relevance. They persuade (although he said this point doesn’t work alone: stories need the other elements too before they become persuasive). Jo talked about how brains are wired to automatically create stories. We’re creative beings; we imagine the lives of other people and we think in stories. That goes for the workplace too: your team are responding to project data in a story-led way. In other words, where you don’t provide all the details about your project in effective project status reports and through other communication channels, your team and other stakeholders will fill in the blanks for themselves. And from experience, they normally create a much more dramatic narrative than what’s happening in real life. If you want your team to remember what you are telling them, frame your messages as stories. Think about how your project benefits relate to changing the lives of customers, or how what you are delivering will impact others. Jennifer Aaker from Stanford Graduate School of Business has shown that stories are up to 22 times more memorable than facts alone. When stories and data combine, they pull at the audience intellectually and emotionally, creating a perfect situation for remembering. 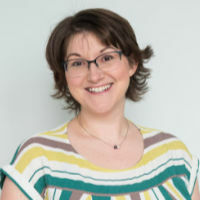 Jo touched on the ethical aspects of this, pointing out that you cannot be seen as manipulative and that you should bear that in mind when constructing the messages you want to communicate. Does an SPI of 0.8 tell you anything about the project? Project managers will know that it only means that your project is running behind; it’s Schedule Performance Index. There’s nothing in that number alone that tells you why. The data provides the factual, measurable evidence but the narrative provides the context. The story that goes with the SPI explains the mitigating factors and gives you the chance to fill in the gaps. The story will still say that your project is running behind: you aren’t going to change the facts. But it will provide the ‘why’, the part that your project sponsor really feels the need to understand. Stories are surprisingly like workplace reports. Jo pointed out several similarities which I have noted in the table below. When college friends get together, Jo said, there are two words that they use probably above all others, and that have the effect of excluding anyone who wasn’t part of the friendship group at the time. Stories, he explained, are a fundamental communication form that provide meaning and that allow us to pass down meaning. We do this through the stories that help frame our family’s values and what kind of people we are. We do this through reading Room on the Broom – we are a family that values reading and literature and triumphing over dragons by pulling together. Stories create bonds because they are the memory of lived events (not the triumphing over dragons, obviously, although sometimes after a particularly difficult commute home it feels like I have). They incite action and they can shape behaviour. That’s what we want at work. It’s important to project managers to have stakeholders and team members who take action and behave in ways that support what you are trying to achieve. You need to work alongside people who have the same outlook as you, and the lived experience on the project team helps create your own stories. I might not have explained this very well, but Jo’s presentation was probably the best thing I saw at Congress (sorry Todd and Tarik). Both my degrees are in literature and the marrying of a literature-based perspective with project management ticked all the right boxes for me. 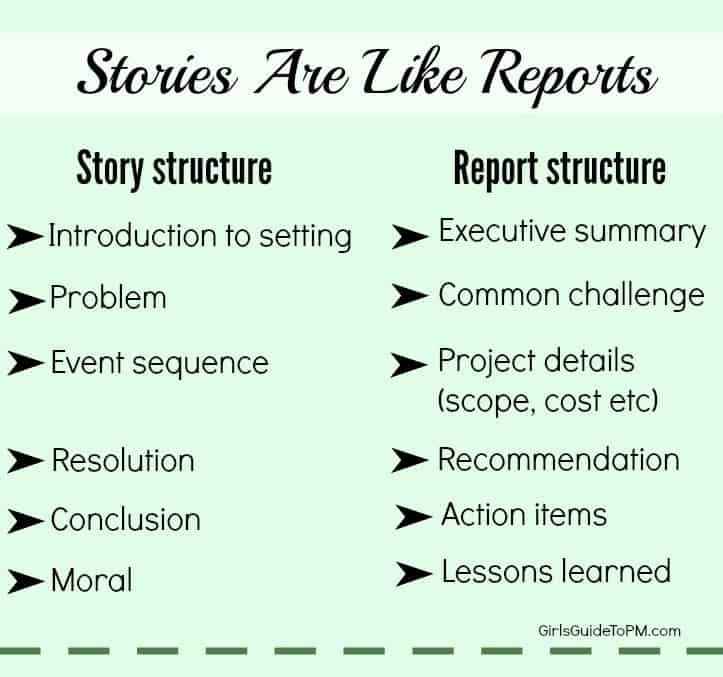 In a later article I’ll be explaining how you can take all of this and use it in a practical way to weave stories into your project management communications and status reports. 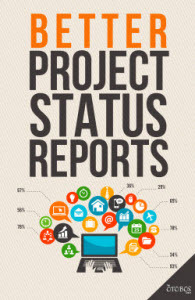 In the meantime, if you need a hand with writing better project status reports and getting your message across, please check out my Better Project Status Report course and ebook – it will help you get your stakeholders to take action. The link for “Better Project Status Reports” was broken and I would like to take a look at this book. Rosanne, I’ve updated the link now. Thanks for pointing it out!